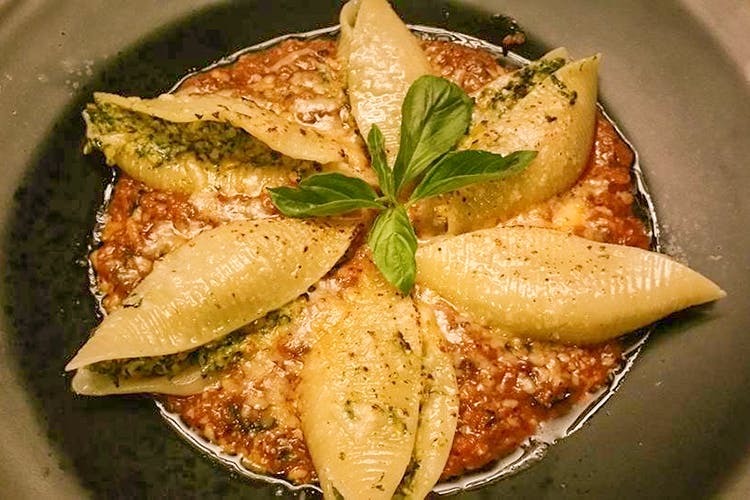 London Cafe in the unlikely Sector 63 market, Noida is a classy affair with a menu comprising Italian and north Indian fare. Hop in for a cuppa coffee or some healthy fresh juice. The restaurant is super-stylish and comfortable. Dim lighting, comfy high-back sofas, colourful cushions and a long bar table in a corner give the look and feel of a cafe straight from the streets of the London. To add to the warmth, paintings, lanterns, artificial flowers, vases and a wooden bookshelf spell magic, just like icing on a cake. The culinary journey started with their signature Java Coffee Blast. Sprinkled with coffee beans on top, the creamy texture of the coffee was divine. Next on the table came Potato and Cashewnut Croquettes and Arancini Di Risso. Soft on the inside and crisp outside, the croquettes melted in our mouth. It was served with Garlic Aioli which complemented the taste well. Arancini Di Risso stood out as the star dish of the evening. It was served with fried noodles at the bottom and beautiful risotto balls on top- it looked like a nest with brown eggs. The main course was the Cottage Cheese Steak. The melange of flavours makes it a must-try dish on the menu. The steak was stuffed with basil pesto and served with mashed potatoes and stir fried vegetables. The meal was paired with two amazing mocktails– Dirty Slush and London Cafe Spice Surprise. Dirty Slush is a unique blend of crushed ice with lemon juice, sugar syrup, ginger aioli, blue curacao and grenadine syrup. The sweet and tangy taste of the drink was completely different from all the mocktails that we have tried till date. The London Cafe Spice Surprise was a mixture of guava juice, pineapple juice, orange juice and fresh green chillies. Zesty. The Chocolate Brownie with vanilla ice cream smells divine and was the perfect way to round off the meal. This post was first published on ChattoriAunty here.